Fred W. Neher was born in Nappanee, Indiana, on September 29, 1903, according to Indiana’s Laughmakers (1990) and Who’s Who in American Art (1980). The 1910 and 1920 U.S. Federal Censuses recorded Neher, his parents and two older brothers in Nappanee at 301 North Main Street. His father was a tailor in 1910 then a grocery salesman in 1920. Fred Neher’s first cartoon appeared in 1920 in the magazine Judge, two years before he was graduated from Nappanee High School. He already had gotten $2 for a drawing he made at the age of 12 of a woman hanging up clothes. He took a correspondence course in cartooning while in high school, and after graduation he went to the Chicago Academy of Fine Arts. 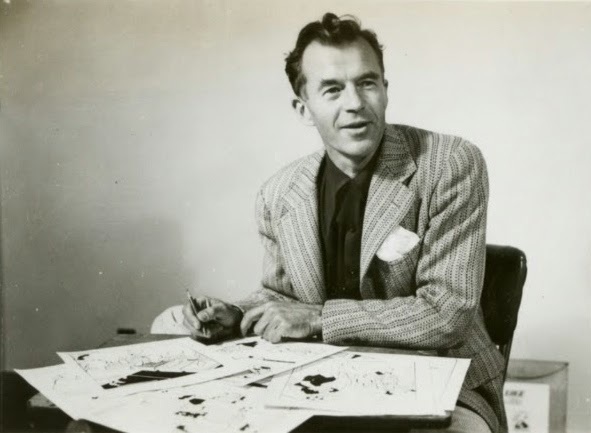 For a while he did backgrounds and penciled in the dialogue in cartoons in a strip [Doo Dads] drawn by Arch Dale. 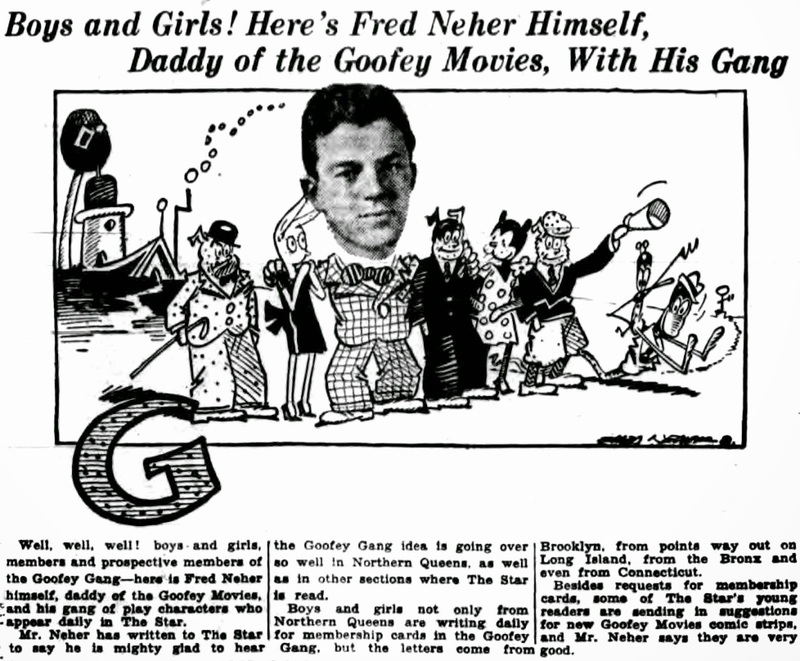 The Doo Dads entry in American Newspaper Comics (2012) said: “Fred Neher says he assisted on the feature in the mid-1920s.” Emboldened, Neher continued Feg Murray’s McDuffer from August 25, 1924 to April 2, 1927. A year later, Neher started Otto Watt which ran from August 31, 1925 into 1927; it was continued by other artists. December 27, 1925 was the start date of his Goofey Movies, which ended in October 1930. In the 1930 census, Neher was married and resided in Cleveland, Ohio on East 101 Street. The Daily Camera (Boulder, Colorado), September 25, 2001, said he married Frances A. Rutledge on September 7, 1929, in Chicago. In 1934 Neher started Life’s Like That which ran for 43 years. American Newspaper Comics said it had many alternate titles: Bubbles, Hi-Teens, Mrs. Pip’s Diary, Sis; Some Punkins, The Colonel, Us Moderns, Will-Yum and Zeke. International Who’s Who in Art and Antiques (1976) said Neher’s cartoons appeared in magazines including Colliers, the New Yorker, Punch, Everybody's Weekly, Life, Judge and College Humor. Neher’s home in 1940 was on Greenwalde Drive in Kings Point, North Hempstead Township, Nassau County, New York. The cartoonist had two sons, Fred and James. At some point the family moved to Norwalk, Connecticut. The city directories for 1946 to 1948, and 1951 listed Neher at Silver Mine Avenue North. The Daily Camera said he moved to Colorado in 1951. 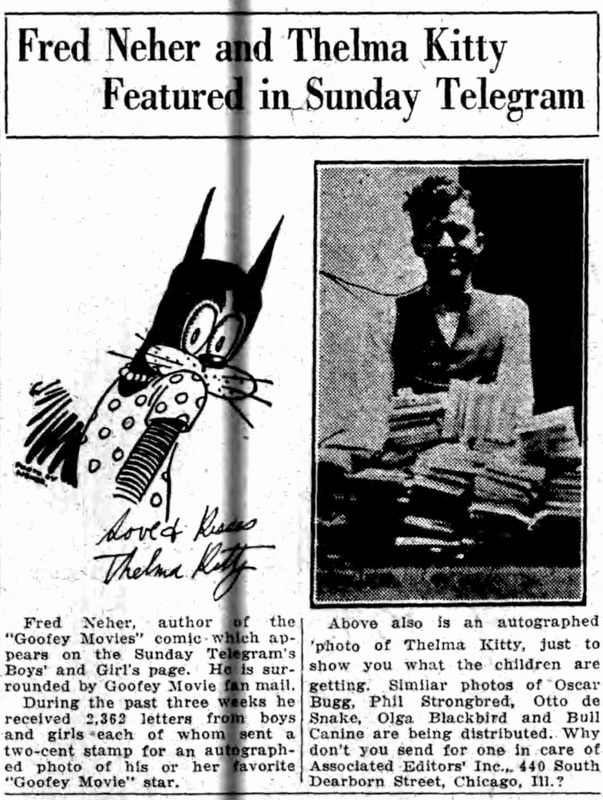 Neher’s listing in the 1953 Boulder, Colorado directory said: “Neher Fred W (Frances R) cartoonist h end 19th”. Who’s Who said Neher taught cartooning, beginning in 1964, at the University of Colorado in Boulder. A 1965 photograph of Neher with Dik Brown, Mort Walker and Bob Bowie is here. In 1987 his wife, Frances, died. Neher passed away September 22, 2001, in Boulder. Obituaries were published in the Daily Camera on September 23, and 25. Those were not alternate titles for Life's Like That. Rather, they were titles for recurring themes or characters within the feature, as seen in the sample panels in the Wikipedia entry for Life's Like That. At least, in the Sunday pages.